Imphal, a city rated as a dangerous place to be due to local insurgents (rank 32 in the world at high risk of terror strike), this meant heavy military presence and several checkpoints in this part of North East India. The images of this stretch are here: End of Manipur, Nagaland to Kohima, Nagaland Kohima to Cheteba, Nagaland Cheteba to Zunheboto and Zunheboto to Dibrugarh. We had rested a bit in Imphal and were ready to proceed further to the north. Andrew, the Australian, teamed up with us and had a great short cut in mind to leave the Chamalou UFO guesthouse, we cycled off and into the maze of back roads. Soon we decided to head for the sure road marked on the map and make some distance “Thank you Andrew for the short cut 🙂 ”. We had expected heavy traffic on the NH2 to Kohima but instead we got a nice a scenic road with a small climb to 1800 meters. People really are so friendly and not the stereotype which is sometimes described by other travellers when travelling in India. We knew the North Eastern states would be different from mainland India but not to what extent. As we got the tradition in Myanmar to stop at tea houses for our snacks along the way we continued this here in India as in most towns you will find this Tea Hotel where a range of snacks are sold and accompanied with a cup of milky sweet tea. We stopped in a small town not sure the name of it and had some samosas and tea. Soon enough a man wanted to know where we were from and where we were going and of course what our purpose is of visiting his town. These are common questions but here people are very interested in our purpose of visiting. 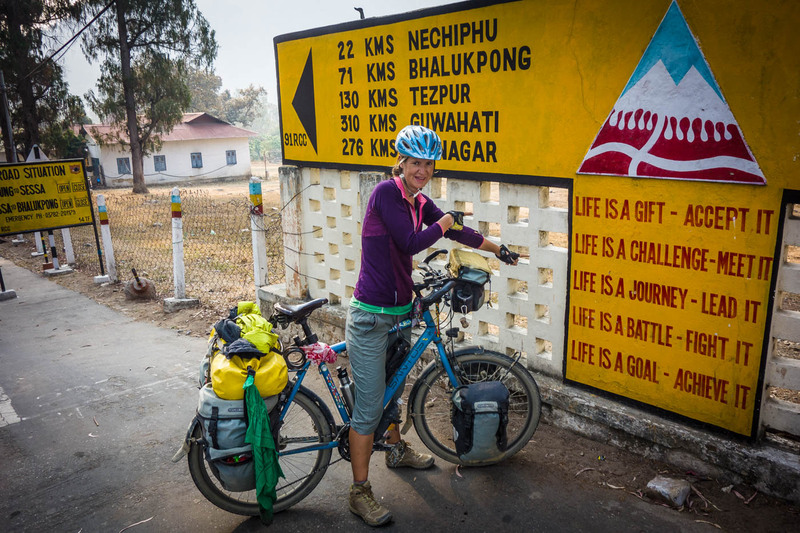 These states of India rarely sees tourist and let alone cycle tourists. Now that the Tamu – Moreh border is open more people travel through here but only small amounts of people explore the region. We were now in the hills and here the tribes have been for centuries and all have their own languages and the faces of people really differ from tribe to tribe. Since the early 18th hundreds missionaries have been converting people to Christianity and have had success in the hills as most hill tribes of the North East India, and especially Nagaland are now christians. This subject we will return to later in the post and share some insights. To return to the questions often received “What is your purpose here” we have the feeling that this has some connection to earlier visits from missionaries, there is no preconception in the question but has a slight touch of the idea that we are here with a purpose other than being a visitor. We said our goodbyes and had our photos taken x 10, if we thought people in China took many pictures of us our frame of reference has now changed as Indians take 100 times more photos of us, no harm done but sometimes we have to decline the offers and be on our way again. The uphill was quite gradual and we were enjoying the ride with the three of us and the people were happy to see us. For lunch we had chow, a fried noodle dish, and tea in a small fooding hotel. The locals here really enjoy their chillies and are not shy of spicy food so Susanne had to go for the roti instead as it was too spicy. More small talk with some locals and some photos where shared 🙂 and we continued our cycling up the mountain. Camping here is not so common and the region is quite populated so we were thinking of the choices for the night. Andrew had enjoyed some hospitality with the Assam rifles, this is the army controlling the area and we had stayed in a church. We had reached the town of Senapati and to our surprise the town had several hotels we decided to stop as sunset was only an hour away and we had no stress. We asked around and finally decided on the 3D hotel a standard Indian hotel for 400Rs. Had dinner in a restaurant not a lot of choices on dining so had a simple chicken curry with rice. Martin had a lassi which turned out to be a bad choice as it returned with some upset stomach for the coming days. The top was in reach and we cycled off in the morning and had 300meters to climb or so. Soon we came past a wedding where we were invited in to say hello to the bride and groom and got some Nepali snacks. Apparently there is also a population of Nepalis as they have served in the army here. Was a nice meeting and we enjoyed the small interaction with the people and of course the photos. As we are on the road now for more than 2 years we know many other cyclist and often somebody knows somebody who is cycling or going to cycle where we are so messages are shared and meetings are set up. On this day we knew that a polish couple Anna & Szymon where cycling in the opposite direction so we should meet somewhere along the way. We had lunch and checked our phone and got a message that they where having lunch in Mao just 6km away so we sat of and met half way more or less on the top of the pass. Shared some stories and nice chocolate cookies “Thanks Anna and Szymon!”. Hugs and goodbyes, we all had to cycle on. We wanted to reach Kohima, the capital of Nagaland as we had arranged to meet up with Yakuza a local Naga guy who has cycle toured as well and we could all stay with him and his family. We had underestimated the distance and had a few distractions during the day so the end of the day was drawing closer as we were cycling towards the city. Nagaland, a state of the North East has a strong history of tribal society and this still has an influence on the state. Kohima, the state capital and home of the Angami tribe one of 16 tribes all with different languages. This means that English has been incorporated as the common tongue and most people speak English very well. Naga’s are very proud of their heritage and have been almost not conquered in battles. Naga’s strongly feel that they are not Indians. At the same time also here cultural traditions are reclining because of Christianity and the desire to live a more modern lifestyle. Riding into Kohima at sunset was hectic as the streets are narrow and in a bad shape but traffic still quite heavy. We found our way with help from some locals who knew of Yakuza. We were warmly welcomed to his and his moms house on the hills of Kohima. The streets of Nagaland are less well kept than in other states because the money is not invested in roads. There is quite a bit of large private property around but the roads are at times bumpy and rough. Staying in Kohima was great and Yakuza took great care of us! “Thanks man!” We had a small excursion to the Khonoma village in the the mountains and they were preparing for an annual festival of purification and the villagers were making decorations. We joined in and had a good time there. We also visited the local market and one of the delicacies in Nagaland is dog. We had seen images on the internet and were highly surprised when we entered one part of the market and were confronted with a heap of live dogs waiting to be processed into dogmeat. Interesting but also slightly shocking experience. Yakuza is a great influence on the local community and is part of the 72 hours project of Kohima where more or less every week a group of people go to clean the streets from rubbish. Kohima was a great place to be due to Yakuza and his family, we really had a hard time leaving, Andrew decided to stay and enjoy the great company. To go further north we had a few options and we decided on what we thought was the average road to Dibrugarh we got a whole lot wiser about secondary roads of Nagaland. We had made our route planning as always only this time we had not used google maps so only with our paper map and offline open street maps. This turned out to be a small mistake as the road would become 100km longer than planned and therefor we decided to skip going to the Mon district because of time. Going out of Kohima we already noticed that the map on the GPS was not correct, this we have had before so we did not worry too much about it. Soon after we had a nice downhill to the first river and there we started to notice that the road did a whole lot more turns and twists than the straight road we had on the GPS. Anyway we continued and we reached the small town cheteba where a family quickly invited us home. They run a students hostel and we got to stay in one of the rooms as the students have not yet arrived. We had a really great evening and they prepared great food for us. The road had been quite rough and we had been going up and down so only covering 55km that day. The road more or less only got worse but we enjoyed it as no cars and very little motorbikes so very peaceful but hard work on the bicycles. 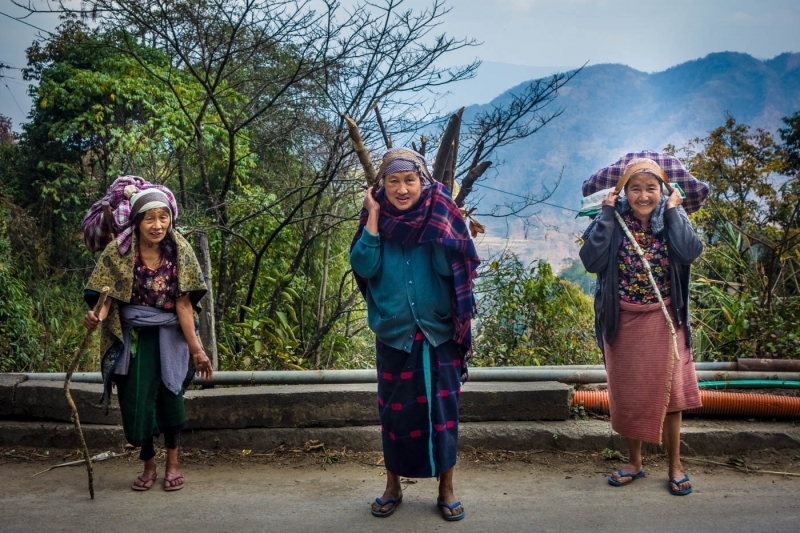 In Nagaland villages were built on the hill tops to be harder to conquer in the days of tribal rivalry. This meant that the road always went down the valley side and up the mountain side to the top and repeat this a ton of times 🙂 We enjoyed the hills and fresh temperatures, the people and culture. We slept one night at a big church in Satakha where they had guest rooms. The Christian influence has meant that traditions has been abolished and replaced this has influenced their society and maybe brought peace to the region. We find it hard when great cultures are replaced with western ideologies but we are not here to judge and if this is what the people want it is good. As we passed through towns we noticed the differences of the tribes and mix of people, some very interested and others very shy. We pushed ourselves past sunset to reach Mokokchung for the night and that meant 9,5 hours of cycling on tough gravel roads and steep hills. We made it and found a hotel where we could stay the night. Here we decided not to go to Mon and continue to Dibrugarh due to time as our permit to Arunachal is only 30 days and would start on the 6th of March. So we took the fast road to Dibrugarh 190km and better roads. Stayed with a family near Tuli and the next day we reached Dibrugarh. 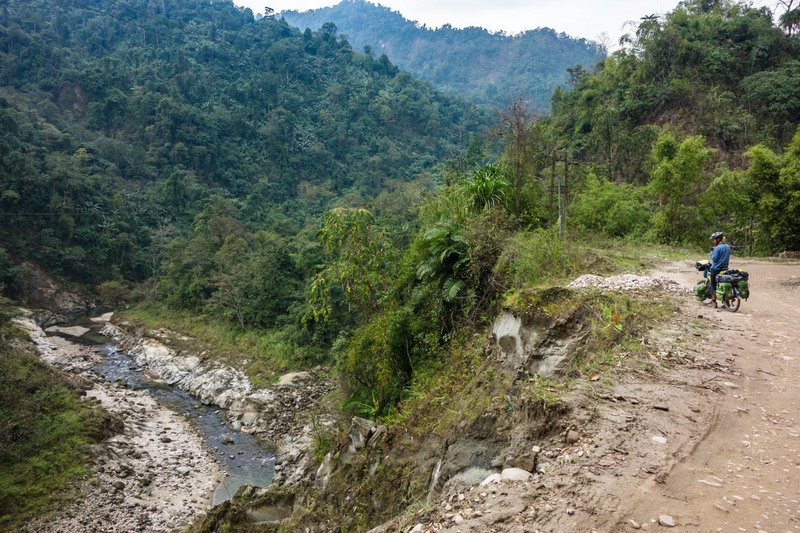 We had expected an easy ride to reach Dibrugarh, but again the GPS and our chosen track deceived us and took us through the jungle on a tiny muddy track. It took 2,5 hours to ride 12 kilometres which was very slow. Coming out on the other side we immediately felt the change. We had left Nagaland and were in Assam. Motorbikes were following us on the streets, everybody was saying hello and waving. We had to answer very often where we were from and where we were going. A good first test of the real India. It was a real hectic experience! 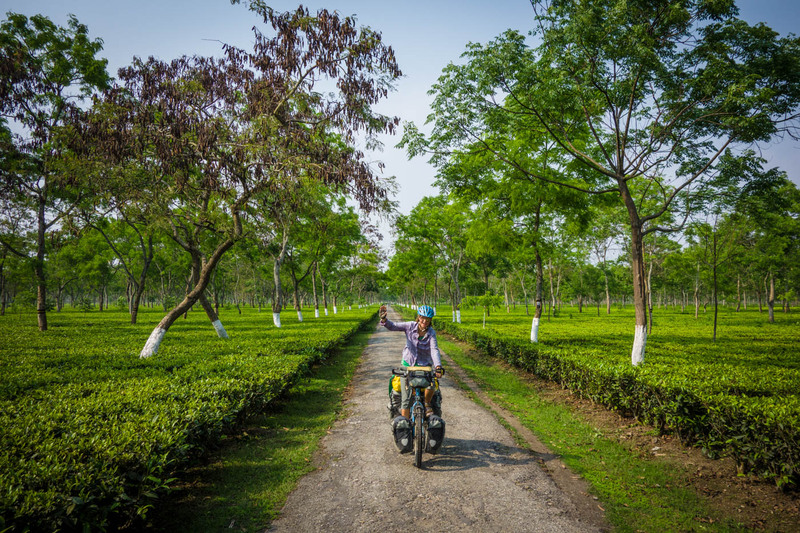 We have seen our first flat tea plantations and went towards Dibrugarh where we will meet the Brahmaputra river. On the way to Dibrugarh Martin had a small accident as his tooth, which got fixed back in Kyrgyzstan broke again. We had arranged through Couchsurfing with Partha that we could stay at his family even though he had to leave for a business trip. We enjoyed our stay here and went to an Indian dentist, also an experience. Now fingers crossed that the tooth is okay and stays that way for the rest of our journey. From here we take boat over the Brahmaputra, will cycle a bit in Assam and enter Arunachal Pradesh!! I feel motivated to go there for this summer. Is it okay if I go solo there ? OK – Arunachal Pradesh permit. Some simple advice where or how did you obtain it? Please. Does it work this way?